The book Grundfragen der sozialistischen Preistheorie1, again an acquisition which was bought from the second-hand bookshop Helle Panke in Berlin, discusses an uncommon problem, namely the price formation in an economy with central planning. In the west it is generally assumed that product prices can only emerge from the demand and supply on the market. The collective of authors under the leadership of the East-German economist K. Ambrée shows that the planned price formation does work. The planned product price can even serve as an instrument in order to incite the producers to rationalize their production process. A word of warning is in place. Your columnist is not an expert on price formation. Unfortunately his knowledge about the theme is limited to engineering economics, such as is applied in the design of production processes2. This is evidently not nothing, but it is still insufficient for reviewing the contents of Grundfragen der sozialistischen Preistheorie. The reader is requested to see this column as just a first attempt, which tries to provide for an introductory text about the theme on the web. In modern managerial economics the feasibility of a given project is tested for its profitability. The demand curve determines the product price p(Q), which is required in order to clear the product market with a supply of Q product units. The supply curve determines the price p(Q), which allows the producers to offer a quantity of Q product units in a profitable manner3. In the intersection of the demand- and supply curve there is a match between the buyers and the producers, so that this point represents the market equilibrium. The figure 1 depicts the equilibrium in a graphical manner. Moreover, she shows that the shape of the demand curve depends on the market structure. This is apparent from the two displayed supply curves, namely one for the monopoly and one for many competing producers. The supply of the monopolist reaches its lowest product price in the situation with an optimal capacity utilization. Below and above this point the unit price is higher. On the other hand the situation with many competing producers gives priority to the most efficient producers. Therefore the price rises in a monotonous way with Q. In the former GDR the word demand was sometimes replaced by the German term Bedarf, which will be translated here by requisite. The formal definition of the requisite is the whole of individual needs of consumer goods and services, which is acknowledged by society4. If the supply is not attuned to the requisite, then the demand will adjust to the actual supply, and assume undesirable forms. In a planned economy the price is no longer determined just by the market (demand and supply), but the social interests are also taken into account. This has the potential to make the system more efficient, but it evidently complicates the price formation. The Austrian economist F.A. von Hayek (1899-1992) has once stated, that the central planning can not possibly function. His argument is, that the information of the individual traders on the market can never be collected and processed by a central agency. The success of the East-European trading association CMEC5, which survived for decades, is sufficient to refute his claim6. In the present column the policy of the planned price formation will be described on the basis of the structure in the CMEC states, and notably in the former GDR7. The whole planning system was embedded within the Leninist ideology, but this aspect will be ignored wherever this is possible. All prices must be approved by the central planning authority. In other words, a planned price is assigned to each of the products. The producer (the separate enterprise) can apply for that price directly at the planning authority, or the producer can obtain it in an indirect way by following the central price directives. When there are several producers, then the autohority determines the product price in accordance with the average social production effort. In the planned economy the price has three functions: (1) measure of value, (2) distribution of the total product, and (3) incitement to behave rationally. Thus the price is both a measure, distributive code, and productive lever. The first requirement is that the product price expresses the effort of labour, which is expended during the generation of the product. In the CMEC states the labour theory of value (LTV) was applied, where the added value is determined by the number of labour-hours. However, this choice is not essential. The heart of the matter is that the product price must represent the production costs in some way. In the GDR these were called the Selbstkosten, or simply Kosten. If the costs would be permanently higher than the proceeds, then finally the planned economy would fail. The product price is calculated by a mark-up above the costs with a profit margin of 10 to 20%, which was prescribed by the central authority8. In the GDR this profit was called the Rein-einkommen, perhaps in order to make a distinction with regard to the capitalist profit. For the planned economy is not based on the maximization of profit. The planning agency simply tries to realize an optimal satisfaction of needs with minimal costs. Nonetheless, a rising profit is desirable, because he provides the means for the accumulation (savings) and for new investments. As such the height of the profit rate does enter as a steering parameter. But although the product prices commonly are related directly to the costs, the price can still deviate from the value in certain cases, if desired. It has been remarked just now, that in case of a supply by multiple producers the planned price of the product is based on the average costs. The most efficient producers benefit by this price formation, because they will receive a relatively large profit. This is the reward for their good management, and naturally also an incitement for backward producers. A part of the profit is taxed by the state by means of an obligatory remittance. Furthermore the profit provides the producer with the means to invest by himself, for instance in capacity extensions. The remainder of the profit is added to the premium fund of the workers. Here the lever is at work. In general a single profit rate is planned for the whole economy. The profit rate is related directly to the capital goods, that are employed (in the GDR they were called produktiver or materieller Fonds). Alternative rates (in the German language Raten) can also be calculated, by relating the profit to two parts of that fund, notably the Umlauffonds and Grundfonds9. In those cases the rate is called the fund efficiency. Note that in this convention the Arbeitsfonds (labour) does contribute to th production costs, but is not included in the productive fund. In certain cases it may be desirable to deviate from the planned norm for the general profit rate. For in the planned economy there is no obligation to require the same efficiency for all incurred costs10. Usually a distinction is made between the producer- or industry-prices, the consumer prices, and the currency prices. The industry prices pertain to raw materials and intermediate goods. The leverage of the industry prices must induce the producers (the separate enterprises) to be effective and innovative. For the producers have an own responsability in the arrangement of the production process, and in the improvement of the product quality. At the macro-economic level the incitements have the aim to use the productive fund (that is to say, the material fund of the circulating means and of equipment) in a rational manner. In the formula 1 k represents the production costs, w is the profit, and δp represents the value-price deviations. The value-price deviations serve primarily for stimulating the rational behaviour and as a guarantee for the social interests. Besides they can take care that the financial budgets of the producers are balanced. And finally the value-price deviations are sometimes used in order to bring the demand and the supply into line. Think for instance about price reductions for obsolete and out-of-fashion products. Unwanted stocks can be eliminated by means of price policies. That is to say, the operation of markets remains an instrument in the planned economy, albeit on a modest scale. In the Leninist planned economies greater value was attached to the utility (the term in the GDR was use value) of products than to their exchange value (the price). It can be stated that the product seize was partially determined by the marginal utility. However, in the publications of the CMEC states the laws of Gossen with regard to the marginal utility are rarely mentioned. The marginal utility is less relevant, because many decisions about the production are taken in a collective manner, at the central level. The politicians express the will of the consumers. Then the term utility or use value obtains the qualitative meaning, that larger quantities are identical to a larger utility for the population. Then the utility is not defined as the aggregated preference of the individual consumers, but as a political choice. Since the planning must equate the supply to the requisite, the price that balances demand and supply is only a subordinate instrument for the distribution process. The price is primarily determined by the supply side11. Here the policy in the CMEC states introduced an ideological bias in the utility. Sometimes the need and the requisite of the people were opposed at the central level, because they were in conflict with the realization of communism. For instance, the public opinion was mobilized against unhealthy food, but it was also emphasized that certain cultural expressions were disapproved by the central authority. However, this political-ideological propaganda does not affect the economic performance of the planning system. In the preceding text it has been stated, that the planning authority fixes the product price in accordance with the average social production effort GK. That is to say, contrary to the capitalist economy the marginal costs MK of the production are not the primary determinants of price. The reader remembers that in capitalism the producer must equate his marginal costs MK to the marginal product MO in order to maximize the profit. The figure 2 displays in a graphic manner the difference between the cost variables GK and MK. 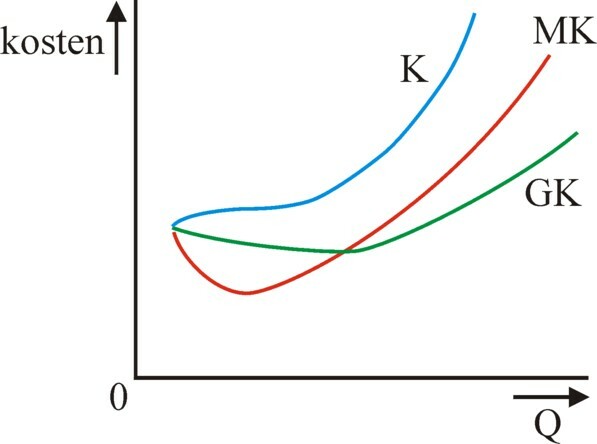 The curve K represents the total production costs, that is used in the calculation of the two types of unit costs. Comparable products (goods which are substitutes) obtain the same price. When one of these products requires higher costs, then his producer will be discouraged by the lower profit margin. Yet the problem remains that new products must be priced. Especially beforehand it is difficult to estimate the costs of the productive effort. In any case a larger utility of a unit new product is always rewarded with a higher unit price. Thus the price of a new product will often be higher than its costs, augmented by the usual profit markup (value-price deviation, see formula 1). The innovative producers can collect an extra profit. This extra-profit must naturally not be so high, that the benefit of the buyer (consumer) is cancelled during the sale. In the GDR this manner of price formation was called parametric (in order to make a distinction with the common calculatory manner). Extra-profits are temporary, and must be gradually eliminated. That is to say, the index is a function of the expended labour Ln and of the physical stocks of the fundamental fund Kn and of the circulation fund Mn. The formula 2 emphasizes the effect of factor substitution. In principe the planned product price measures the value of the product. Nevertheless there can be reasons to deviate from this rule. It has been argued in the explanation of the formula 1, that products such as the primary foods, the public transportation, and housing are subsidized. In this way these products can be purchased by all consumers. In these cases the price is mainly a distribution code. According as the costs of transportation decrease, the international division of labour becomes more adavantageous. Therefore within the CMEC states the plans tried to realize industrial structures, that make an optimal use of the comparative production advantages in each state. Moreover positive economics of scale can emerge, when all production is concentrated on a single location. When the product is supplied both by internal production and import, then the planned price will be calculated as a weighed average of both product prices (mixed price). The economists P. Keat and P.K.Y. Young describe in the book Managerial economics how private enterprises estimate the effective demand for their products. The book Grundfragen der Warenzirkulation im Sozialismus12 shows that in a planned economy exactly the same methods are applied. The most direct way to collect information about the demand is simply the market research by means of representative samples. The investigation yields without detours the demand curve on the market of the product. In a random sample one must take into account local tastes and preferences, income inequality, seasonal fluctuations, and future developments. Future developments may be for instance a change of purchasing power, the competition of a comparable product on the market, or the demographic expectations. 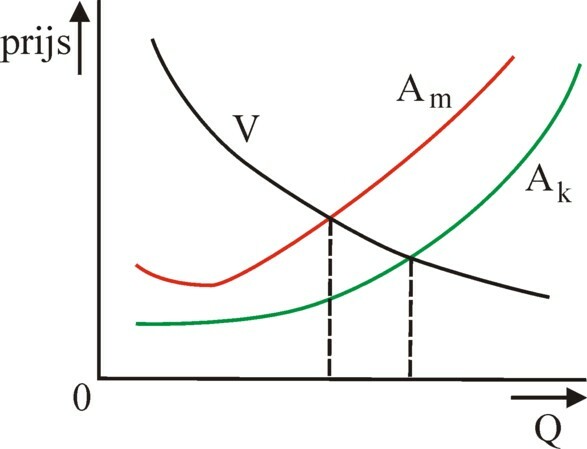 Thus the demand curve shows the price in his role of distributive code for the various groups and classes within the population. The future development of the demand can be predicted with a certain accuracy by making use of regression analyses. Thus for instance the correlations with the demand for other products can be studied, or the effect of expenses for advertising. Or an analysis can be made of the effect of the distance (in kilometres) with respect to competing suppliers. Economic indicators can also be included in the model. Besides the predictions (prognoses) often use the personal views of market analysts and experts. In the formula 3 Δp represents a small change of the price p, and ΔQ represents the change of the demand Q, which is the result of the price change. Obviously εpp=1 the yield is maximal. An even larger decrease of the price will be an insufficient stimulus for the demand, and therefore cause a falling yield. The market research can naturally extend beyond the private market, and also target the demand for collective and social services. The planned economy is better suited for market research than the free market, because all the branch studies can be attuned and coordinated at the central level. Its results lay the foundation for the perspective and five-years plans. The best results of market research emerge in situations, where a cooperation is realized between the industry, the trade and scientific institutes13. In this approach the retail trade is the representative of the consumers. In such an association tests and experiments can be conducted to determine the product demand, in addition to the random samples. In the planned economy of the GDR the state was the authority for all planning, both for the material production and also the price formation and the price development. The planning of the prices and of the material production relations have the form of an iterative procedure. The price level develops in accordance with the predetermined plan, in the short term and in the long term (perspective plan). This is advantageous for the producers, because the uncertainty in the production management is eliminated. The common aim was to maintain stable product prices during a plan-period of five years. However sometimes price adaptations are unavoidable, because the labour productivity develops in a favourable way. or scarcity of raw material emerges, or new boundary conditions are imposed on the production process, such as environmental demands. When the product price is not attuned timely to the changing labour productivity, then a profit-driven inflation will result. In that case the profit is raised in an unintended and undesirable manner. Rising prices of raw materials cause cost-driven inflation. In fact this really occurred in the CMEC association, and she was even indispensable. For the rising price forces the producers to use the scarce resource in a more efficient way. But the inflation due to rising prices of raw materials was tempered on purpose by calculating the planned prices as a running average of the real prices in the preceding years. This method was also applied for the goods, that were imported from the capitalist states. Thus the economy was somewhat protected against the price fluctuations on the capitalist markets. The method creates a buffer. Under the ideological competition between the west and the CMEC states the western economists have generally argued, that the planned economy does suffer from inflation14. This is in fact true, and the CMEC state have not denied it. However, in the planned economy the inflation can be better controlled and flattened than in the free market economy. The price formation in the CMEC states has always taken into account the prices on the world market, because these are a measure for the necessary production effort on the global scale. When the home prices are relatively high, then this signals that the national production process is inefficient. The figure 3 represents the structure of the price formation, that was used in the GDR. The cabinet council has the ultimate responsability for fixing the planned prices. 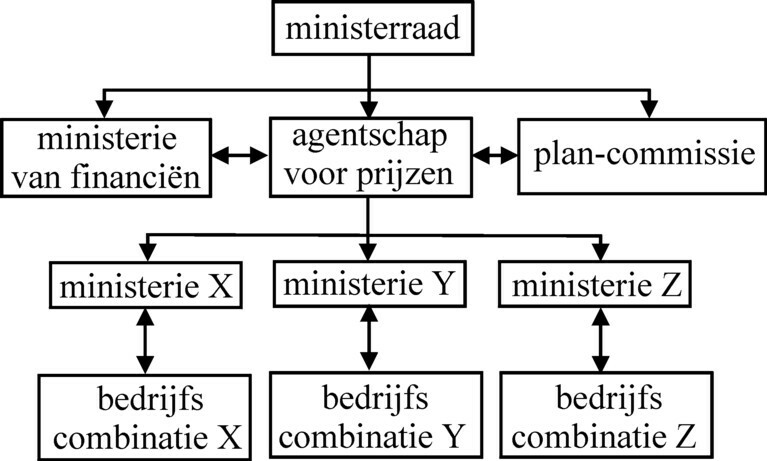 He is advised by staff departments, in this case notably the plan commission and the agency for prices (in the German language the Amt für Preise). The agency coordinates the price proposals of the various ministries. The coordination concerns in particular the control of the general price level (the price index). Important instruments for this task are the construction of the price intertwined balance and of production indices. It has already been remarked, that the price formation is an iterative process. The agency engages in a continuous deliberation with the plan commission, who is responsible for the planning of quantities. Various alternatives are studied, until finally the optimal solution is found. The department of finance makes propositions in order to realize the desired exchange rate of the national currency. In the CMEC states the national currency could not be exchanged into other currencies. Formally the transferable rouble existed, but he was never really used for trade purposes. He remained a passive calculation unit. Therefore the trade agreements were usually concluded at the bilateral level, and not at the multilateral level15. Each ministry or department makes proposals for the price groups within her domain of competence. She deliberates with the producers (enterprises and combines of interprises), that fall under her jurisdiction. The ministries take care of the distribution of price catalogues in the industry and trade. They contain the price norms. Besides norms are published, that describe the development of the prices. Evidently there is a direct connection between the price norms and the material norms. Sometimes the price policy supplements the fixed planned prices with a certain discretionary freedom for the producers themselves. This freedom has the form of maximum prices and of contract prices. In this way adaptations are possible with respect to differences in the bought quantities, quality, and goods made to order. The reader sees that the planning system does really offer room for bargaining. In principle it simply structures the perpetual clashes of group interests. It goes without saying, that the planning organization can never steer all decisions. The plan merely indicates the direction. Therefore it would be unworldly to assume, like Von Hayek, that the intertwined balances are an accurate prognosis of the future. The aim of the predictions with models is naturally the estimation of the tendencies, in the same way that western Central Planning Agencies operate. In the labour theory of value (LTV) each commodity has a value, which represents the expended effort of labour during the production. However, the establishment of the general average profit rate interferes with this law of value. Therefore in this case the price form is called a modified value. The produced value and the realized value on the market differ. Thus in capitalism the result is the production price (in the situation with perfect competition) or even the monopoly price. The modification of value occurs also in the CMEC states, and there results in the planned price. In other words, the price type depends on the organization of society.